Keen players in the global high content screening products market are pouring money into research and development of new technologically advanced instruments that would help the cause of designing new therapies for different ailments. In this manner they are trying to bolster their positions in the market. They are also resorting to mergers and acquisitions to expand their geographical outreach. Since the degree of competition in the global high content screening products market is relatively low at present, many aspiring players are planning to foray into it. 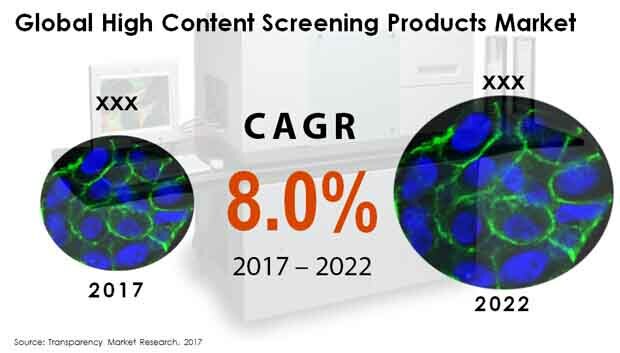 Increasing thrust on cell-based research, various initiatives to develop new drugs, and emergence of more sophisticated image analysis instruments are some of the factors that are serving to drive the global high-content screening (HCS) market. The increasing instances of chronic diseases requiring prolonged treatment such as HIV AIDS, epilepsy and Parkinson’s disease along with the growing requirement of determination and study of toxicity levels in the initial phases of drug discovery is also bolstering the market. Research organizations, pharmaceutical and biotechnology companies, and academic and research institutes are the end-use segments in the global high content screening products market. As per Transparency Market Research, the global high content screening products market will likely rise at a CAGR of 8.0% from 2017 to 2022 to become worth US$1.23 bn by 2022. Depending upon the type of products, the global high content screening products market can be segmented into consumables, microplates, instruments, software, and service. The consumables, among them, hold maximum market share at present. By expanding at a CAGR of 8.3% in the forecast period, the segment will become worth US$486.6 mn in 2022. The high screening instruments too account for a substantial share in the market because of their cost efficiency that results from deployment of LED light engines that brings down the intensity fluctuations and hence negates the need to switch to external illuminating sources. High content screening software will likely grow at a healthy clip in the foreseeable future in the global high content screening market because of features such as confocal imaging and intuitive workflow interface. This helps to bring about development of three dimensional models allowing better evaluation, increased sensitivity precise image capture, and analyzation of more parameters which is predicted to generate more demand in the market in the upcoming years. From a geographical standpoint, North America leads the global high content screening market on the back of increasing prevalence of chronic diseases, a considerable population of elderly, rising collaborations of research institutes, carefully-considered mergers and acquisitions between companies, and an advanced healthcare infrastructure. The market in the region is predicted to clock a healthy 8.2% CAGR between 2017 and 2022. Rising at this pace it is expected to attain a value of US$402.1 mn in 2022. Europe follows North America vis-à-vis revenue generation in the global high content screening products market. It currently accounts for 25.8% revenue share in the global high content screening products market. This is mainly because of the substantial investments in healthcare and government regulations in the region. Vis-à-vis growth rate, Asia Pacific is projected to outpace all other regions. By the end of 2022, Japan high content screening products market is projected to reach US$113.1 mn, by registering a CAGR of 7.8% over the forecast period. Some of the prominent participants in the global high content screening products market are Thermo Fisher Scientific, Molecular Devices, GE Healthcare, PerkinElmer Inc., Becton, Dickinson and Company, Thorlabs, Inc., Merck KGaA, Cell Signaling Technology, Genedata AG, and Yokogawa Electric Corporation. The report on the global high content screening products market factors in every possible driver and restraint shaping the trajectory of the market. It studies all such trends in-depth. It also segments the market based on different parameters and examines each segment thoroughly to uncover where the opportunity lies in the market. This is to help readers gather a proper idea of the market’s hierarchy and thus understand which segments to invest in. The geographical analysis of the high content screening products market provided in the report also tries to educate savvy market players about the best regions to invest in. The report also sheds light on the competitive dynamics prevailing in the market. To do so, it leverages market leading analytical tools such a Porter’s Five Forces and SWOT Analysis. Such methods helps to gauge the opportunities and threats the market presents. As per Transparency Market Research, the global high content screening market will likely rise at a CAGR of 8.0% from 2017 to 2022 to become worth US$1.23 bn by 2022. The report discusses the various drivers affecting the growth of the global high content screening products market. It finds that regulatory factors play a key role in stoking growth. For example government support for cell-based research for creating new and more effective drugs for various diseases has been providing a fillip to the market. The report glances at various other prevailing diseases that have provided a boost to the market. Companies wanting to bolster their positions in the global high content screening products market need to keep in mind such growth drivers to take advantage for the opportunities. The report provides readers with detailed analysis of which factors are likely to have a lasting impression on the global high content screening products market in the coming years. The report studies the segmentation of the global high content screening products market. It assesses the leading segments in the market to understand their impact on the global market’s dynamics. Consumables, microplates, instruments, software, and service are the different types high content screening products available in the market. At present the consumables dominates the market with maximum share and are predicted to clock a healthy CAGR of 8.3% in the forecast period to become worth US$486.6 mn in 2022. The high screening instruments too account for a substantial share in the market because of their cost effectiveness owing to the use of LED light engines that brings down the intensity of fluctuations and hence negates the need to switch to external illuminating sources. Among the regional markets, North America runs the show with most of the share in the global high content screening products market. Increasing prevalence of chronic diseases, a considerable population of elderly, rising collaborations of research institutes, carefully-considered mergers and acquisitions between companies, and an advanced healthcare infrastructure are some of the factors majorly fuelling the market in the region. The market in the region is predicted to clock a healthy 8.2% CAGR between 2017 and 2022. Rising at this pace it is expected to attain a value of US$402.1 mn in 2022. Thermo Fisher Scientific, Molecular Devices, GE Healthcare, PerkinElmer Inc., Becton, Dickinson and Company, Thorlabs, Inc., Merck KGaA, Cell Signaling Technology, Genedata AG, and Yokogawa Electric Corporation are to name a few key players operating in the global high content screening products market.